Posted April 14, 2019 by greendog & filed under anxiety, behavioral tip, cat health, kidney/UT problems. Both wild and feral domestic cats prefer to eliminate in different areas outdoors every time, covering the scent of their waste in the soil. Luckily, indoor cats are pretty amenable to using a litter box as long as conditions seem acceptable to them. Just know that if they ever start to eliminate outside the box, they’re telling you that something is wrong. Though it may seem to humans that this behavior conveys “spite” this is not the case. Realize that what you’ve asked them to do is against their true nature, so be patient and aware that they need your help to modify the situation. The general rule is to have one box for every cat in the house, plus one. Don’t force cats to use the same box, and perhaps put some space between them if possible. A bigger box with higher sides keeps mess contained. Hoods can make things even tidier for a big digger, but not all cats feel safe losing that visibility. If you want to use a hood, get them used to a new box without the hood first, and then pay attention to their reaction. Sometimes a really deep open topped Rubbermaid storage container is the solution for cats that kick their litter everywhere. Put all boxes in quiet, low traffic areas if possible. Find a litter you both like. Most cats prefer a softer texture such as a scoopable clumping litter. The downside is that all scoopable litters track. Use a good litter mat or a fluffy bath mat to capture the mess. The upside is that when you find a litter that clumps quickly and firmly, removing those clumps leaves very clean litter behind keeping your box nearly odor free. If your clumping litter breaks apart as you shake your scoop, get a new litter and your box will smell fresher. Litter that comes in pellets reduces tracking significantly, but not all cats like the texture. Starting kittens on pellets will likely increase your success. The downside of pellets is that they don’t clump, and urine dissolves them into wet sawdust that is harder to remove entirely. Keep the level of litter shallower than a scoopable litter (just a few inches vs. 3-4” of scoopable) so not as much litter is ruined at a time. Perhaps use a solid spoon or spatula to lift urine spots when scooping pellets. We recommend unscented plant based litters (made from grass, corn, wheat, etc) over clay. These litters are more sustainable than clay, as all clay is strip-mined, it uses more fossil fuels to ship as it’s heavier, and it doesn’t degrade. 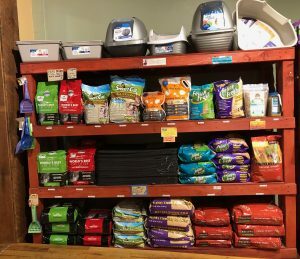 Plant based litters are lighter to carry and to scoop, they generally clump quickly wasting less litter, they handle odor well, many brands aren’t as dusty as clay (and clay dust is dangerous to breathe), and the bags last longer than clay, saving you money. Keep your boxes clean. Scoop once a day. Having that extra box mentioned above allows them to find a clean spot if you’ve forgotten to scoop. Cats prefer as little odor from their boxes as possible (as do you). Empty and clean your box regularly. You can spray with an enzymatic cleaner and wipe clean and dry and refill with clean litter, or take it outside and hose and scrub. Pro Tip: Cats fed dry food generally have more concentrated and smelly urine. Switching to a moisture rich diet helps the urine smell and their health. Even better, a raw-fed cat’s box generally doesn’t smell! Their poops are smaller and firmer and not as stinky, and their urine doesn’t really smell either. If you walk into your house and you can smell your well maintained boxes, look to their diets to solve the problem. When switching litters, a sudden switch might be upsetting. 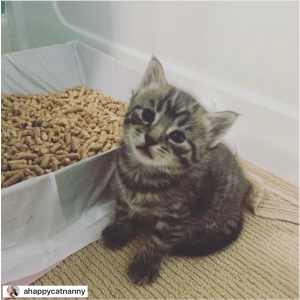 Use your extra box to introduce a new litter, and if they jump right in and use it, you’re done! If they never use it, try adding a layer of their old litter to the top of the new litter, or put a urine clump from their old box into the new litter. If you happen to only have one box, try to replace clumps you’ve removed during cleaning with the same amount of fresh litter. Eventually your box will be mostly new litter, and the next time you empty your box you can fill it entirely with the new litter. If they boycott their box during the process of switching, go back to the old litter and try a different one in the future. 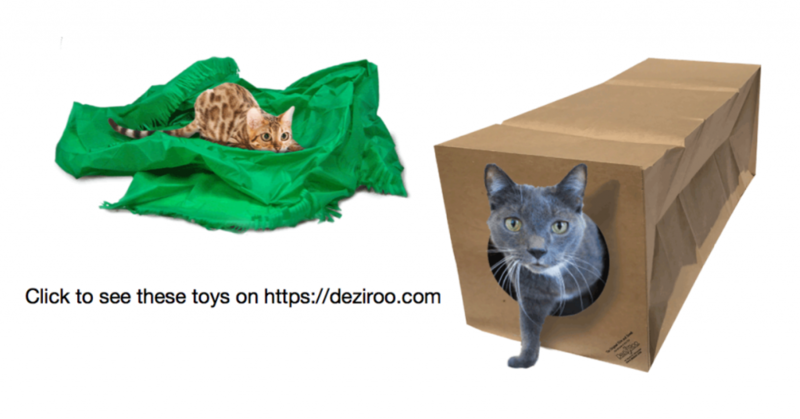 If your cat suddenly stops using their box, the very first thing to do is bring them to the vet to eliminate medical causes such as urinary infections or crystals. When in pain, cats often hide their symptoms. They often associate pain with the litter box and try to find a place to go where it might not hurt as much. Other symptoms can be howling in the box, excessive licking of the genital area, blood in the urine, and frequent attempts to urinate. If your cat ever visits the box repeatedly, strains to urinate but voids little to no urine, it’s vitally important to rush them to the vet or to emergency care if it’s after hours. Urinary blockages can be a life threatening emergency, especially in male cats. **Once an infection is cleared, cats often still blame the box for the pain they felt. Dr. Elsey’s Cat Attract litter may help. They also make an herbal attractant that you can add to other litters of your choice. It can be really helpful. – A new member of the household, person or animal. – A new outdoor cat in the neighborhood who might be marking under open windows, in a crawl space under the house, on the outside of an entry door, etc. – Another cat in the household intimidating them in ways you may or may not have noticed. Their intimidation tactics might seem very subtle to us. – Humans having frequent disagreements. – Living with an adult that doesn’t like them. – Children chasing or harassing them. – Lack of environmental enrichment/stimulation/exercise. 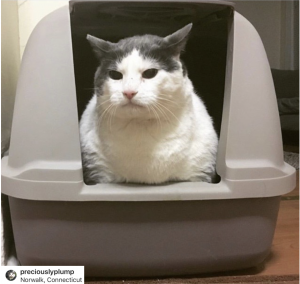 – The cat finds something about his litter or box that is stressful, such as a change in litter (especially one with a strong scent, relocation of box, change in the room the box is in, etc. Expelling urine outside the box for many of the reasons listed above would be qualified as “marking”, which is not an elimination behavior, but a sign of territorial stress. As Dr. Karen Becker, DVM says, “Under no circumstances should you ever punish a cat for improper elimination. Imagine if you were forced to relieve yourself in a dirty, cramped or unnatural spot, with activity swirling around you. Then imagine being punished for finding a more suitable location for yourself. The reason for their behavior may not make sense to you, but it does to your cat, and now is a good time to remember he is, after all, a different species! 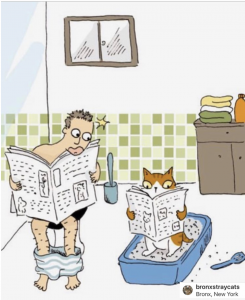 Your pet needs your help to find the cause of his behavior and fix the problem.Work with your cat, not against him, to help him be comfortable with his potty area”. Here are some ideas for managing your cat’s environment and lowering his stress to help to resolve the problem: Of course reevaluate your box situation and all of its variables. If it might be a new person or someone that the cat is uncomfortable around, try to enlist their help and sympathy (as they’d probably like the marking to stop too!) Have them try to stay calm and speak softly near the cat. Have that person gently toss a treat the cat likes in front of him and retreat without approaching too directly. Have them put the food bowl down at mealtimes. They might be willing to play a little with a wand toy or string, etc. No rough or overstimulating touching, like roughing up the fur – let the cat approach them and they don’t approach the cat. – Try Feliway Multicat diffusers in the home when the issue might be another cat, and original Feliway in the case of children or a dog. – Increase the number of scratching areas available. – Can the space be managed to give them their own areas for a while? – Look at your common areas and see if you can increase the amount of vertical space for the cat. What if you could put a high-backed chair in between the couch and the mantel to make it accessible to a cat? Cat trees are useful of course, but inexpensive shelves made with scraps of wood and L-brackets can be used to create high spaces for cats to retreat and feel secure (especially useful when there are children or new puppies in the home). If there is another cat, make sure there are no dead ends to the escape routes. – Ask yourself if the cats would be happier in separate homes. – Don’t allow puppies or children to chase the cat. Puppies can drag a leash when supervised, and reward the puppy (and praise children) for calmness when a cat is in the room. CBDs are very safe and effective for calming anxiety. We carry a tincture that is completely tasteless for mixing into food, and a few that are in treat form. Lastly, cats (especially those with excellent nutrition and care throughout their lives) can live into their 20s. But when cats reach a certain age can often become confused or stressed, especially at night. They might seem to be forgetting elemental things, like where their box is. You may need to add additional boxes in the home in places that they seem to be spending more time (as opposed to hidden in the back of the basement). Perhaps add a nightlight near their litter box, use litter attractants, or if the cat seems restless at night or howling excessively, try an unflavored CBD tincture in a bit of canned food before bedtime, or a Feliway plug-in. Talk to us – we’re here to help brainstorm.